Think You're Tuff: A Circuit Training Challenge! Do you think you are tuff? Then I challenge you to give this workout a try. I can guarantee, unless you are a top notch conditioned athlete, this circuit training routine will give you a run for your money. Place your bets! Some guys think that the only way to challenge themselves with a good workout in the gym is by lifting as much weight as they can possibly fathom. The belief is that by lifting heavy for 4-6 reps and then resting and allowing their muscles to fully recover and then going again they will get the most bang for their buck from their workout. If that describes you, I challenge you to give this workout a try. You won&apos;t need a single weight, and even more unbelievable, you won&apos;t even need equipment besides a pair of running shoes and most likely lots of water. Granted, you might not gain as much pure strength from this plan as you would from a heavy lifting session, but you will work your body in a way it is not used to and will give it a much needed break from the regular routine. I can guarantee, unless you are a top-notch conditioned athlete, this circuit training routine will give you a run for your money. So place your bets with your workout buddy on who will last until the end. The following exercises are to be performed in a circuit fashion, taking as minimal rest as possible. 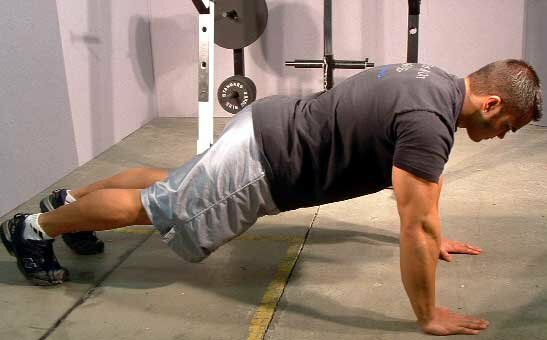 Progress from one exercise to the next, performing 20 reps of each, and once you have completed the entire list of exercises repeat again for a total of 6 times through (assuming you make it this far). If needed, you can take a one to 2-minute rest period between each circuit of exercises (after all 6 are completed before moving on to repeat the entire thing once again). Remember, as with any other exercise, proper form is essential. Just because you&apos;re tired, it is still critical that you maintain the correct position throughout the exercise otherwise you will be really doing no good whatsoever and might as well just go lay on the grass. 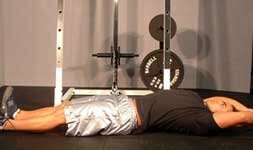 To perform this exercise, lay flat on your back on the floor (or on top of a mat). Next, with your arms out and by your ears, simultaneously bring your knees up to your middle with your head and chest coming to meet them. This should look similar to an accordion action. If this is too easy for you, the next step would be to move your arms so they are directly above your head and rise to point toward the ceiling when you crunch up. Since they are increasing your lever length, this will be an added challenge to the exercise. Measure out 50 meters in a field and after you have completed your chinnies, run as fast as you can there and back. When performing this classic exercise, remember to keep your body as flat as possible (don&apos;t let your back arch upward or downward) and try and go as far down to the ground as possible. Also be sure you hands are no more than shoulder width apart so you are effectively targeting your triceps muscle. To perform this exercise place your hands by your ears once again (as you did in the chinnies exercise) and have your feet shoulder width apart. Then fully (and I mean make sure your bum gets as close to the ground as you can manage) squat down, pause and then slowly squat up. This is not a speed exercise and should be done in a slowed and controlled manner. Make sure you knees are moving directly in a straight line above your toes or you could risk suffering from knee pain. Jackknives are fairly similar to Chinnies except you are to have your arms directly up above your head and your legs remain straight. So, laying on your back on the ground, you are going to raise your legs up to the ceiling while also bringing your upper body and arms up as well, so you are making a &apos;V&apos; shape with your body. 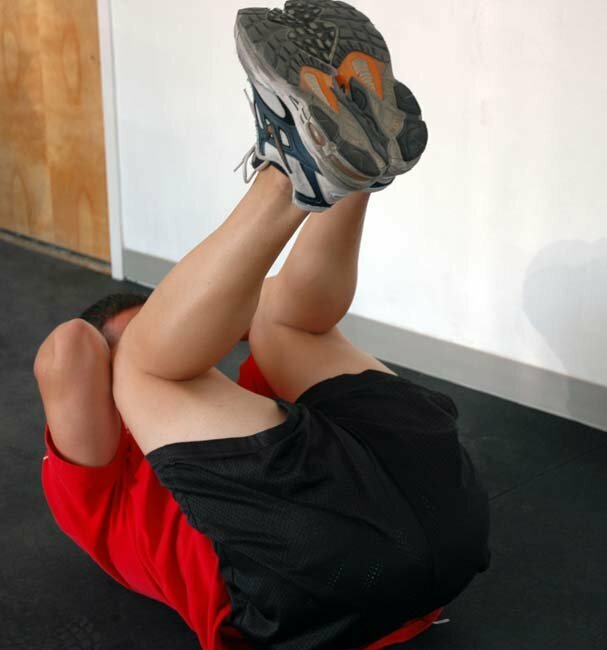 This is a difficult exercise for your core and hip flexors and the important thing to remember is to try and keep your legs as straight as possible. Also, try your hardest not to let your legs and arms touch the ground on the way back down. If they do, this is alright, however try and advance to a level where they can remain in the air the entire time. This exercise is done by starting in a simple standing position. Then you are going to bring one knee up to your chest as far as possible while bringing the opposite elbow down to meet it (with a slight crunch in the waist). This exercise is a speed exercise and should be completed as quickly as possible (you will begin to take a &apos;running&apos; motion as you are doing it). Everyone&apos;s favorite!! Start in a standing position and then squat down so that your hands are placed on the floor. 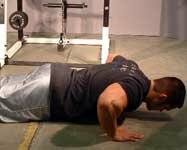 Then kick your legs back so they are behind you and you are in the &apos;up&apos; position of a push-up. 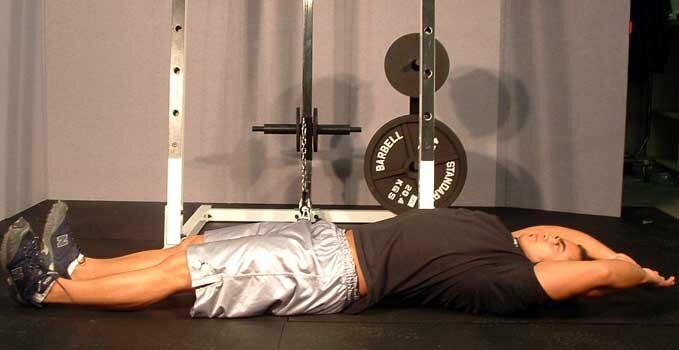 Then once again bring your legs back under you (you will then be in a squat position again) and spring up as high as you can into a full jump, followed by returning once again into your squat position so you are ready to kick your legs back to complete the second rep.
Continue these actions in a fluid motion until you have completed all 20 reps.
Click Here For A Printable Log Of This Circuit Training Routine. While this routine will not replace a good weight training program, as it does not incorporate all the muscles in the body, it is sure to break you out of any plateaus you are in, challenge your body (especially your cardiovascular system) to new lengths, as well as put some excitement back into your training. This routine can also be done as a replacement for your normal cardio routine as a large portion of it is sprinting, which offers a great deal of positive effects such as an increased VO2 max and increased fat burning efficiency. As with any other exercise, be sure to take a day off between circuits if you are planning on completing this workout a few times per week. It doesn&apos;t necessarily have to be done on a regular basis however to reap rewards. It could simply be done on a day when you don&apos;t feel like going through your normal training or are feeling like challenging yourself with something new. One thing this plan will surely teach you though, is that circuit training is definitely not only something for girls with light weights, even the strongest athletes can be put to the test with this one!